In the era of real-time information overload, the average person is estimated to be exposed to 34 gigabytes of content in a single day — from countless of different sources and channels — from the time they wake up in the morning until they sleep at night. The volume of information requiring attention, understanding, and processing, becomes even more complex for those in professional, knowledge-intensive industries, often resulting in information fatigue, attention fragmentation, and low productivity. And this is the problem our latest investment —Smarp — is tackling. Announced today, we are thrilled to share the news of our €4.2 Series A round in the Finnish scale-up. The round will allow the Smarp team to grow their presence in London and beyond, and hire 100 new employees in the next 18 months. 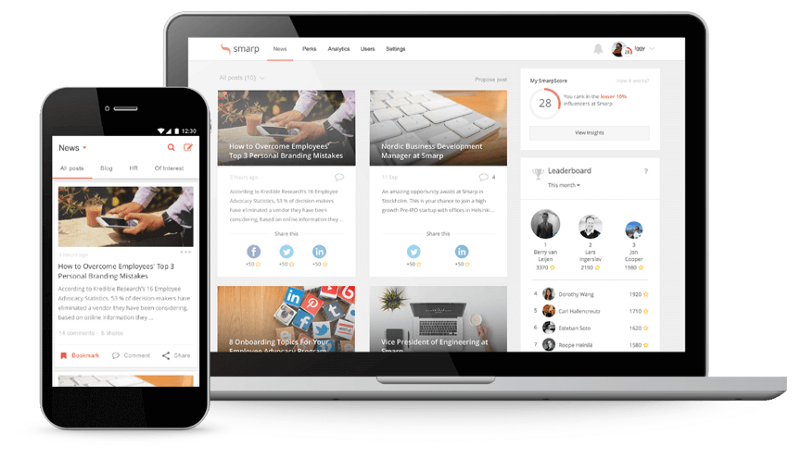 Smarp is a content hub for large enterprises that enables more intelligent, efficient and productive sharing of content and knowledge across an organisation’s employee network. Founded in 2011, Smarp is addressing the content and knowledge sharing market, estimated to be worth $2bn globally. More specifically, through its solution, Smarp is solving the issue of disengaged and disconnected employees — a problem estimated to cost large companies $60 million every year. While a number of workforce collaboration platforms have come to market over the years, these solutions are typically siloed, top-down oriented and non-optimised for the changing landscape of enterprise communication. Recognising the need for a simpler, smarter and more scalable end-end solution, Smarp’s offering provides a unique employee-centric platform that delivers better connectivity, information sharing, and employee engagement to enable stronger levels of brand advocacy for clients. Enterprises and their employees enjoy better access to more personalised and relevant content feeds; curate and exchange knowledge with the right person anywhere, anytime and disseminate information with greater ease through their social networks. As a result, companies are able to drive faster and more informed and impactful decision making for the business. Operating out of Helsinki and London, Smarp is Nauta’s first portfolio company to have been born in the Nordics and — a fact we are excited about! Through this investment, Nauta will play a key role in helping Smarp scale quickly in the UK, reinforcing the natural corridor between the Nordics and UK, where London often serves as the landing hub for European scale-ups. Smarp’s impressive track record, experienced management team and capital-efficient DNA, made for a great fit with Nauta. The platform is used by more than 250 clients including brands such as L’Oreal, Valeo, and Mulesoft, and have built a fantastic track record in the employee communication and knowledge sharing space. Headed by Co-Founder and CEO Roope Heinilä and COO Mikael Lauharanta, Nauta’s London General Partner, Carles Ferrer, will join Smarp’s board.